Home : Beauty : How do you get shiny hair? How do you get shiny hair? “How do you get shiny hair?” this question I asked so often that I decided to share my secrets. Well, I must admit healthy diet and sufficient sleep are important for your hair shine. However, if you aren’t a fan of healthy eating and 10 hour sleep is a luxury for you, there is a lot can be done with effective hair products to ensure maximum protection and nourishment for your hair. 1. Moroccan Oil Shampoo Extra Volume. All I can say: it works! I noticed a significant improvement in my hair condition after first use. Silkier, smoother and healthier looking shiny hair. Very economical too, you only need a tiny amount to wash your hair. 2. Moroccan Oil Conditioner Extra Volume. I’m a big fan of using conditioner and shampoo from the same range as I believe it allows them to work better that way. 3. Moroccan Oil Treatment Light, for fine and light-colored hair. I was a bit skeptical about using “oils” as a few other brands I tried were too greasy or too heavy for my hair. Yet Moroccan Oil is a real game changer! You can’t even feel it on your (damp) hair once applied and once blow dried, your hair will feel like baby – silky and soft. So, if you haven’t yet, I highly recommend to try this oil especially if you color and straighten your hair often. Learn more about MoroccanOil here. 4. John Frieda Freeze-Ease Daily nourishment leave-in conditioning spray. John Frieda is my second favorite hair care brand. I’ve been using them since 2006. Well priced, great quality. This spray is light, full of vitamins, offers great protection and most importantly, helps to instantly detangle your hair! 5. Redken Heat Styling Satinwear02 ultimate blow dry lotion. I already written about this product here. But due to its amazing qualities – light, effectively protects your hair from heat-styling and color from fading, I keep re-purchasing this red magic bottle and hence, I’m recommending it again. 6. John Frieda Brilliant Brunette runway straight smoothing milk. Thanks to this product I don’t use iron (hair’s worst enemy) to straighten my hair that often. Instead I rub a small amount of product into dump hair then blow dry. Also I use it to tame away annoying fly aways by gliding hands over dry hair with a touch of product. And, it is specifically designed for brunettes to illuminate brown tones. Shine, baby, shine! 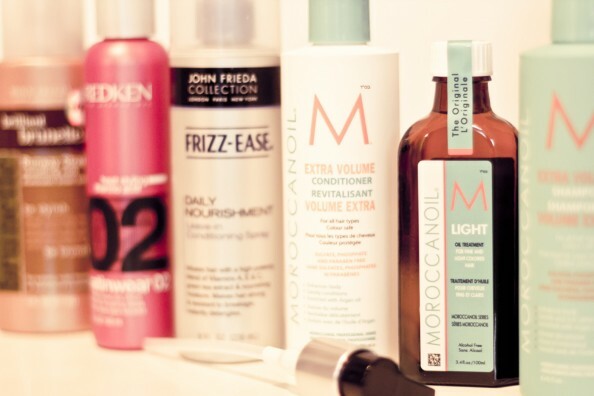 In Australia you can buy Moroccan Oil and Redken products from hair salons, and John Frieda – from supermarkets or chemist shops. Tip 1: for additional care and silkiness I’d recommend to make a nourishing mask for your hair at least once a fortnight. Nikki from StylingYou wrote a great post on hair masks that you can read here. Tip 2: end with a rinse of icy cold water. Water acts to “close the pores” of your hair, so your hair will look shinier when it dries. Hope you find this list useful, darlings. Do share with us your tips on how to make hair shiny and favorite hair products. Disclaimer: I haven’t been paid or asked to write this review, all products were bought by me except for MoroccanOil that were given to me to try (big thanks for that as they are truly magical). Ending with an ice cold rinse is so good, I do it too!